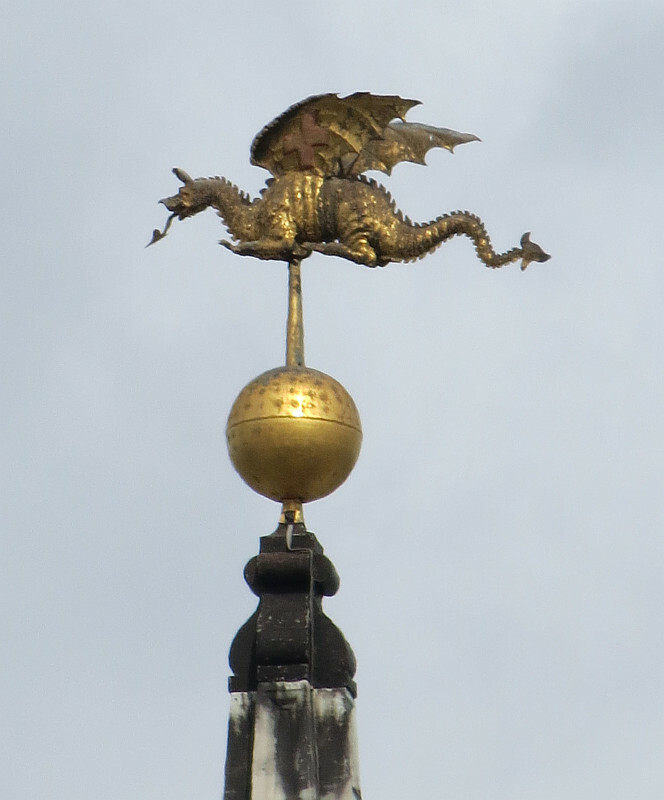 Edward Pearce's dragon atop St Mary le Bow . The sculptor Edward Pearce (also spelt Pierce) was the son of a painter by the same name, and is of interest for his contemporary portraits of several great men of his times, and as one of the sculptor/masons working on the City Churches of Christopher Wren. Little is known of Pearce’s life. It has been surmised, reasonably, that he was born between 1628-32, and certainly married in 1661, to a widow, Anne Smith. He lived in the City – registered as being in the parish of St Botolph’s when married, his premises either in ‘the lower end of Surrey Street’ as stated by the historian Vertue, or Arundel Street, as stated by the more recent sculptural historian Gunnis. His date of death is known to be 1695, and he is noted at that time as being in the parish of St Clement Danes. Around that time, a record of the sale of his collections of artworks, apparently owned jointly with the painter Thomas Manby, is recorded. He worked as a sculptor of statues and busts, and also as a carver and mason for Sir Christopher Wren. The source material for Pearce’s work for Wren, coveniently collected in the Wren Society volumes and elsewhere, is sometimes a bit ambiguous, with payments being recorded rather than necessarily the actual work done, but we know that he worked at St Swithun Cannon Street, St Andrew’s Holborn, and St Benet Fink, was the builder of St Clement Danes, and did both building and stone carving for St Laurence Jewry in 1671-81, where the costs of his carved festoons, leaves and lace are recorded. 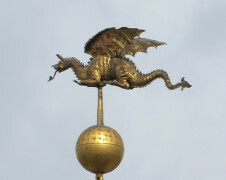 For St Mary le Bow he designed the splendid dragon weathervane of 1680 (see top of this page). I am not aware of any of Pearce’s statues which have survived, but he first came to my attention as the sculptor of the splendid portrait bust of Christopher Wren in the Ashmolean Museum – a dashing figure, with long curled hair, an expressive, mobile face, wearing heavy drapes. The surface is carefully worked with continually changing contours, very plastic. In the Museum of London, rather poorly displayed, is one of his busts of Cromwell, rather heavy in the jowl and its features, showing a forcefulness of character, and with the same variation of contour in the face; a marble bust, less good to my mind, is again in the Ashmolean. Apart from this work, Pearce also is recorded as making various garden ornaments, pots and the like, and a few existing objects are ascribed to him on the basis of likelihood and scraps of contemporary description. With the loss of his statues and much of his other work, he can still be appreciated for his busts, and the prominent St Mary le Bow weathervane dragon at least.